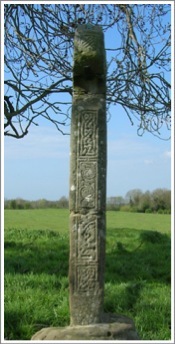 This page highlights the cross at Tihilly in County Offaly. It includes An Overview of the Cross, an Introduction to the Site and the Saints, and my personal story of Getting There. Note that the cross as re-erected is turned 180 degrees from what the illustrations suggest. The descriptions below reflect the current alignment. Below the second illustration are three photos showing, as in the second illustration, the North, West and South sides of the cross. 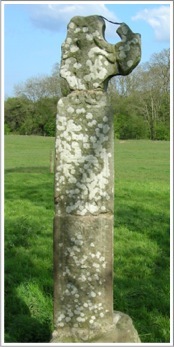 The east face of the cross, is illustrated above and pictured to the right. 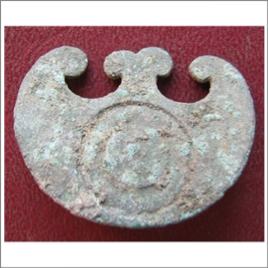 Working from the bottom up, it depicts has two birds with interlocking necks, and with a human head between them on the bottom of the panel. Above this is a panel of human interlace. There is a head in each corner and the legs of these figures come together in the middle. Above this is a spiral fret-pattern. It is clear from the photo to the right that much of this design is difficult to make out. 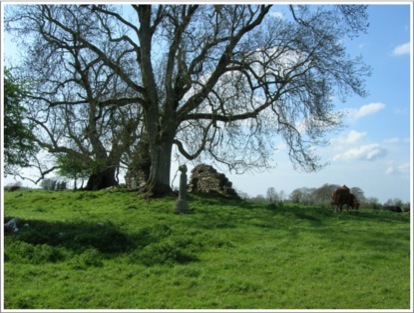 Some of the history of the Tihilly site is described in an article entitled “The Old Graveyards in Durrow Parish” written by Sterling de Courcy Williams in 1897. Piecing together information from many sources Williams tells us that Tihilly (Teach-Telli) was founded by St. Fintan. The remains include the church, the ruins of which can be seen in the photo below, the high cross, visible in the foreground, and two cross slabs illustrated above in illustration one. 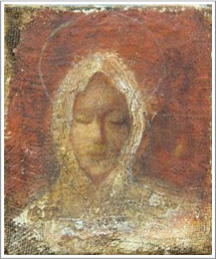 Later, “the Holy Virgin, Cera, who was said to be the daughter of Dubhe, and of an illustrious family of Muskerry in the new county of Cork, applied to St. Fintan for a situation on which to establish a nunnery, and he is said to have assigned to her the place where he had been himself, afterwards called Teach-Telli.” (Williams, 1897, p. 133) More on these two saints below. The Annals of the Four Masters notes that Teagh-Tilli was burned in the year 670. In 723 note is made of the death of Rubyn, chief scribe of Munster and the son of Bryan of Tihill. The Annals of Clonmacnoise tell of the death in 741 of an Abbot of Tihilly. In 865 we are told of the death of Cosgrach, scribe and anchorite of Teach-Teilli. The last note on Tihilly that Williams found was for the year 936 when Robhar tach of Teaoh-Teilli died. (Williams, 1897, p. 134) The Monastic Map of Ireland lists Tihilly as a men’s monastery that probably did not have a community after the 10th century. (Monastic Map of Ireland) The monastery appears then to have had a community from the early 7th century through the 10th century. At least during the time Cera was Abbess, it was a nunnery or perhaps a double house (with both men and women). It is generally agreed that Tihilly was founded by St. Fintan Munnu, who also founded a monastery at Taghmon in County Wexford. Fintan later gave the monastery over to St. Cera, a Holy Virgin. And so, a little background on both of these saints. Fintan’s story is told by Adamnan, ninth Abbot of the Monastery at Iona in his Life of Columba, written sometime in the early 7th century. There we read “St. 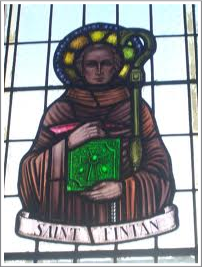 Finten, who was afterwards very well known throughout all the churches of the Scots (Irish), having, by the grace of God, preserved from his boyhood purity of body and soul, and being devoted to the study of divine wisdom had nourished from his youthful years this one resolve in his heart, that he would leave Hibernia and go abroad to St. Columba.” (Adamnan, book 1, chapter 2) He arrived at Iona shortly after the death of Columba in 597. He presented himself to Abbot Baithene, successor of Columba, and requested to become a monk in the Abbey. Baithene told him no and explained why. Some time before, Columba had given Baithene a prophesy, “shortly after my welcome and earnestly longed-for departure from this world to Christ, a certain brother from Scotia (Ireland), named Finten, son of Tailchan, of the tribe Mocumoie, who is now carefully guarding his youthful years with a good life, and is very well versed in sacred studies, will, I say, come to thee, and humbly ask thee to receive and enroll him with your other monks. But this has not been appointed for him in the foreknowledge of God, that he should become the monk of any abbot, for he has long since been chosen of God to be an abbot of monks and a leader of souls to the kingdom of heaven.” (Adamnan, book 1, chapter 2) An so, with a blessing from Baithene, Fintan returned to Ireland. It was not long after that Fintan established the monastery at Tihilly. The date was not long after 602. He remained at Tihilly for about five years. His time there ended when he turned the place over, lock, stock and barrel, to St. Cera. He apparently went from Tihilly to establish the monastery at Taghmon with which he is primarily associated. One day, Cera with five companions, came to Tihilly. She said to the steward “Tell the strong man who owns the place to give it to me, for he and his fifty youths are stronger than I and my five maidens are, and let him build another house for himself.” (Williams, 1899, p. 66) Whether this is factually true or not, it suggests that Cera was a very direct and assertive woman. “Fintan complied with her request, ordering his pupils to bring only their axes, books, charisma’s, with their ordinary clothing and the two oxen which drew the wagon with the books; but he refused to bless her, and told her that the church would not be associated with her name but with that of Telli, son of Segin.” (Williams 1899, p. 66) It is interesting to speculate on what combination of divine direction and political pressures caused Fentan to comply with Cera’s request. The story suggests he did so with some resentment as he refused to bless Cera and her companions. It is unclear how long Cera remained at Tihilly. She is recorded to have returned at some point in time to Kilkeary. She died on 5 January, 679. This was a difficult cross to find. Part of the difficulty was that I had yet to discover the National Monument Service website. It would have pinpointed the location for me. It turns out it is located about half way between Tullamore and Clara off the R420. Even without the help of the National Monument Service, getting within a few kilometers of the site was easy. I stopped at a nearby B&B to ask for directions. B&B owners typically know every point of interest within miles of their location. Unfortunately, this proprietor said he had never heard of the cross. He did, however, offer me a life line. He called a friend who was able to give us directions. I was told the cross is in a field on the Robinson farm. Thinking like an American, I assumed that meant there was a sign that said “Robinson Farm”. Of course there isn’t. After figuring that out, and remembering the Robinson Farm was supposed to be the first on the right after I turned onto the R420, I was fortunate to find Ms. Robinson at home. Without her assistance I probably would never have found the cross. She guided me through the farm yard, past several barns and through a gate into the proper field. Of course the passage of cows and recent rains made passage through the gate and into the field an adventure of sloshing through mud. Ms. Robinson also told me, along the way, that she wanted to call her husband on her cell phone to see if “the bull” was in the field. It was, but she suggested I could skirt around and approach the cross from the opposite side. Even then I was a little concerned as I was wearing a red jacket. At long last I reached my destination. The cross stands in a small grove of trees at one end of the pasture and the trees sheltered me from the bull. 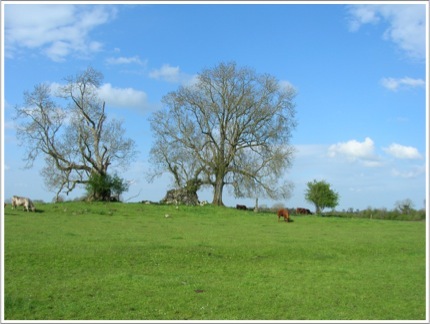 The two trees that predominate the scene are, according to Offaly Tourism two of the oldest trees in the county. 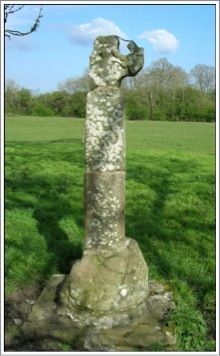 (offalytourism.com) The photo above shows the trees with the ruins between them and the shaft of the cross just visible to the right of the trees It is a sandstone cross about six feet in height. The ruins of a small Medieval Church is nearby, also in the grove of trees. Together the cross, the ruined church and the ancient trees reflect a certain nobility and remind us of the faith of a great cloud of witnesses long dead but ever present. 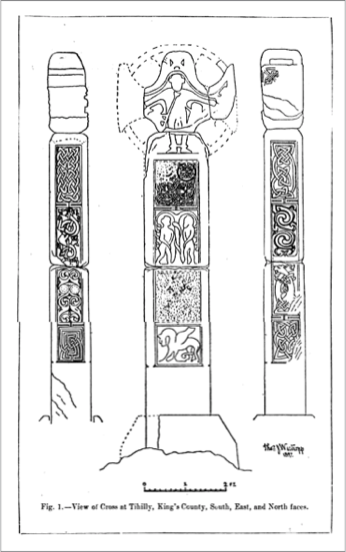 Porter, Arthur Kingsley, The Crosses and Culture of Ireland, New Haven, Yale University Press, 1931. Sill, Gertrude Grace, A Handbook of Symbols in Christian Art, 1975, Touchstone, New York. Williams, Sterling de Courcy, “The Old graveyards in durrow Parish”, Journal of the Royal Society of Antiquaries of Ireland, Vol. VII, Fifth Series, 1897, University Press, Dublin. Williams, Sterling de Courcy, “Tihilly, Parish of Durrow, King’s County”, Journal of the Royal Society of Antiquaries of Ireland, 1899, pp. 65-66, Dublin.